Hangouts on iOS has supported video messaging for a while now -- since February 2014 actually -- and today Google is finally bringing the feature to its own platform. The update has just started rolling out on Google Play and will allow Hangouts users on Android to record or upload up to a minute of footage to sent to their contacts. 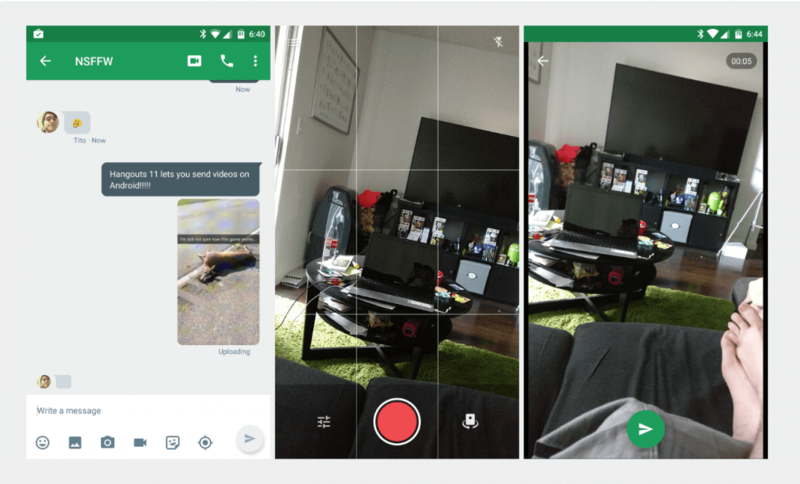 Despite being uncharacteristically left out in the cold by Google for a couple of years, Hangouts users on Android at least get the upper hand in video quality, for now -- the Handouts Android app supports 1080p videos whereas on iOS it’s limited to 360p. Then again iOS users can upload up to 2 minute videos -- whats’ with the fragmentation Google? The update also brings the ability for anyone to remove others from group Hangouts, and drops merged SMS/Hangouts conversations -- Google cited low usage and confusion and the reason behind removing this. You can still send SMS in Hangouts v11 but you’ll see a separate thread for Hangouts, SMS, and Google Voice SMS. The update should arrive on your Android device via the Google Play Store soon, but the APK file is already doing the rounds online if you want to side load it.